As troops and antigovernment protestors clashed on Bangkok’s streets again this week, a furious battle also played out in the media over casualties. Government spokespersons and army officers insisted that bullets had not been fired into the crowds. Their opponents said the opposite. Soldiers had at times pointed their weapons at people, and some of the red-shirted demonstrators had been shot, but there were few reliable details of who was hurt, how, where and why. Staff at the prime minister’s office blamed Red Shirts on motorbikes for a melee with local residents that left two dead. Other sources were less certain about the identities of the protagonists, but doubtful voices were drowned out as local outlets obligingly reported the official version. Meanwhile, emailed narratives of battles around the city had it that the Red Shirts’ rivals were in some areas backing up the army, but there was no immediate evidence to support this claim either. 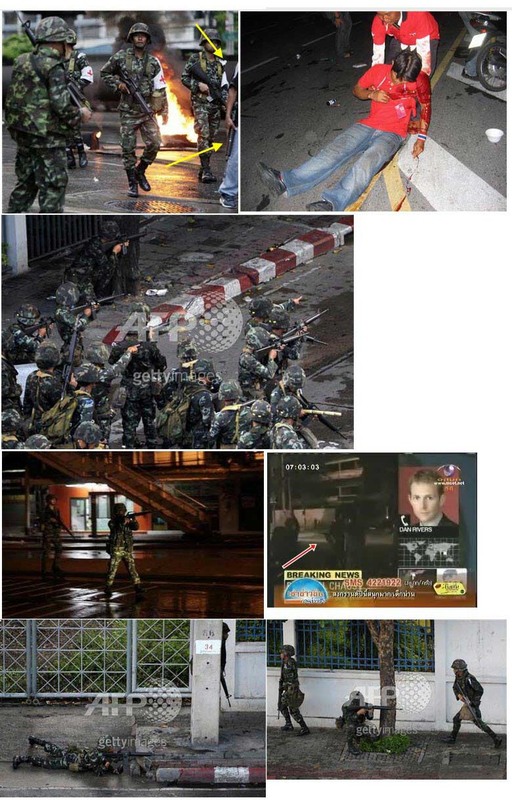 What all this goes to show is not which side is to blame for the street blockades and bloodshed of the last few days, but how difficult it has become to believe Thailand’s media. Since 2006, when domestic news agencies and many overseas ones fell over each other to enthuse about the army’s latest power grab, the biases of newspapers, magazines and broadcasters have become more pronounced, their coverage more partisan, and their opinion-makers seemingly more sure of themselves even as things get less certain. A court in Rangoon on March 5 sentenced three men who didn’t know each other to a decade’s imprisonment for a crime that they never committed – or rather, for a crime so nebulous that if any of them had ever used a computer he wouldn’t know if he had committed it or not. The three, Win Maw, Zaw Min and Aung Zaw Myo, were accused of sending news about the September 2007 protests in Burma through the Internet. All were already in jail for other purported crimes. The next day, police in Bangkok came to one of Thailand’s few outspoken and credible media outlets, Prachatai, searched the premises and arrested its director, Chiranuch Premchaiporn. She is accused of having failed to patrol, censor and delete the comments that readers left on a news website. The police have charged Chiranuch under the Computer Crime Act 2007, which is only an “act” to the extent that the assembly of handpicked military stooges that passed it could be considered a legislature. According to this law, the importing of “false computer data, in a manner that is likely to cause damage” to a third party or the public or “is likely to damage the country’s security or cause a public panic” can land the accused a five-year jail term. Last month a campaign group in Thailand opposing Internet censorship released a list of 1,303 new website addresses that, it claims, are among those a government ministry has blocked. Freedom Against Censorship Thailand notes with concern that most of the pages on the Ministry of Information and Communication Technology blacklist are being kept under wraps with the aid of the courts and a new cybercrime law. The list includes chat pages on the sites of local independent media agencies like Prachatai and Fah Diew Kan, which are both subject to constant monitoring and police harassment, and a couple from The Economist. But by far the largest number of pages is from YouTube and other video sharing sites. Beware of news editors who write about “stakeholders.” The word may be popular among the staff of international development agencies, producing clouded reports about projects that they have never seen, but it is usually avoided by journalists, who are expected to be more straightforward. The fact that “stakeholders” appeared no less than four times in a single Bangkok Post feature last week (Now it is time to move on) should set alarm bells ringing about the condition of journalism in Thailand. The unidentified writer praised the special tribunal that had dissolved the overthrown Thai Rak Thai party and advised everyone that its verdict should be universally accepted, serve as a lesson for unscrupulous politicians that they must play by the rules, and that all stakeholders should just cooperate and move on. Such writing is offensive because it denies readers the opportunity to think and react. It has the opposite effect of real journalism, anaesthetizing rather than awakening society. “The great enemy of clear language,” George Orwell said in his seminal essay on politics and English usage, “is insincerity.” Insincere prose is unpleasant to read because while the truth may not be obvious, the struggle to obscure it with nonsense is all too apparent.